The crystal clear 7” LCD split screen Monitor is a perfect addition to any driver that needs assistance backing up. See the whole world behind you in rich colors. It is also an LCD monitor so it is very light as well as thin. In addition, it has four video inputs so you can connect multiple cameras, game system or a DVD player. When the screen is powered on you have the option to either viewing one camera or all four in a split screen. 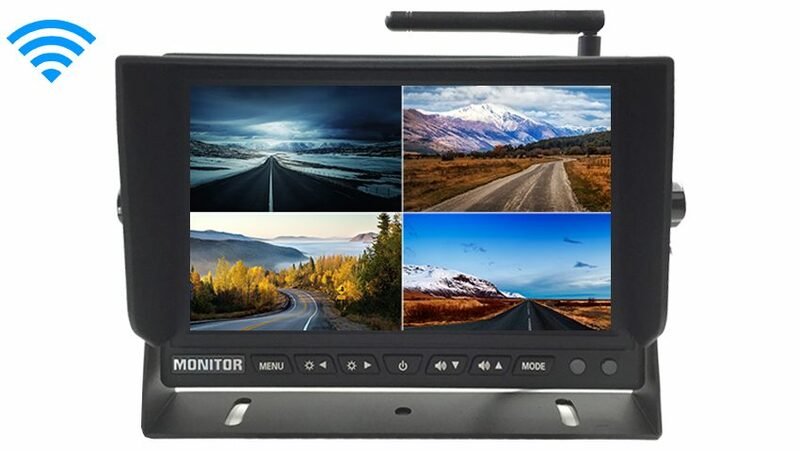 This versatile monitor is compatible with all our cameras and any car; it connects to any power source or a cigarette lighter. It can mount on your windshield or dashboard (mount included). Super easy installation. This item includes a 15 Foot cable, if its going on an RV, BUS or any other vehicle longer than average SUV we recommend upgrading to our premium extension cables located on the top left of the page. Also, This system, like most of our vehicular products that have an LCD screen, can be used for video gaming, consider that a perk or bonus for purchasing our back up system (others block that feature). 30 Days 100% money back guarantee. We know our products are world class and we stand by them 100%. We even have a 24/7 tech team ready for any questions you have. Buy with confidence the TadiBrothers team won’t let you down. All of our products come with a Standard 1 year warranty. At TadiBrothers we also offer an Extended Protection Plan. With the extended protection if anything goes wrong, including you damaging your system, we will replace it with a brand new system at no cost. This protection covers anything and everything.